Super Simple Cat Costume – Nyan Cat! With the new Peanuts movie coming out, I wanted to introduce my kids to the wonderful world of Charlie Brown. So we watched a few clips on You Tube and they were convinced that this would be a cool family costume. 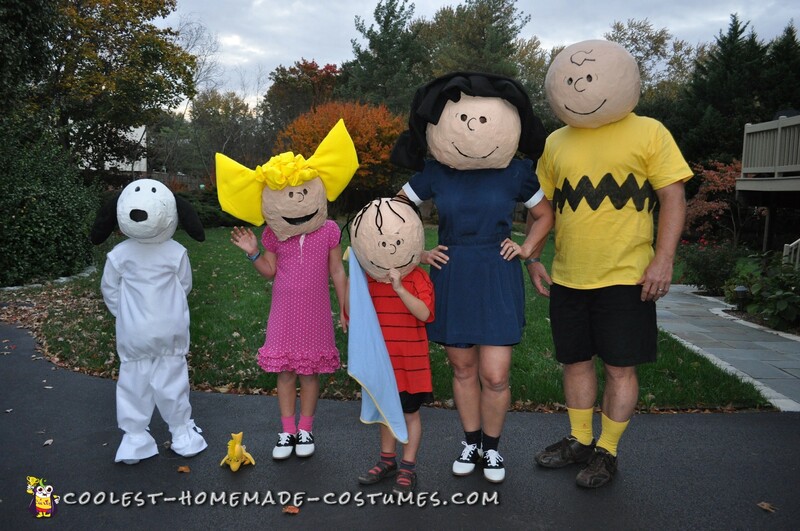 Kevin and Eileen as Charlie Brown and Lucy, Abby (8) as Sally, Ryan (7) as Snoopy, and Sophie (5) as Linus. So the kids and I spent a couple of afternoons doing paper mache. Beach balls, balloons, strips of newspaper, gobs of gooey flour mixture – the perfect ingredients for a messy and fun time! The last head to be made was Charlie Brown’s since he has no hair, his head had to be our best! We painted the heads and added the hair. We used metal coat hangers and yellow felt for Sally’s hair, with some random pieces rubber banded and pinned together to make her curly bangs. We used black felt and rubber bands for Lucy’s hair (and duct tape!). Black pipe cleaners were perfect for Linus’ hair. We sewed black ears out of felt for Snoopy. We cut eye holes and mouth holes for the kids to see and breathe easier. Snoopy could also see out of his nose. The costumes themselves were in the bag. Two Michael’s T-shirts and a sharpie were all that were needed for Linus and Charlie Brown – add my daughter’s blanket and some colored socks and viola! My daughter had the perfect dress in her closet for Sally; saddle shoes and pink socks completed her look. We made some drawstring pants out of white felt and a simple shirt for Snoopy, tied with strips of felt over shoes to make paws. Lucy wore her old high school uniform! My family loves dressing up for Halloween and enjoys doing so as a family. It is one of our favorite holidays! And now we are looking forward to the movie coming out in a few days. We’d wear our costumes but I think the people behind us would have a problem with these blockheads!